The vintage Rolex Date ref 1550 is a stunning Rolex classic and was released in the 1970s. 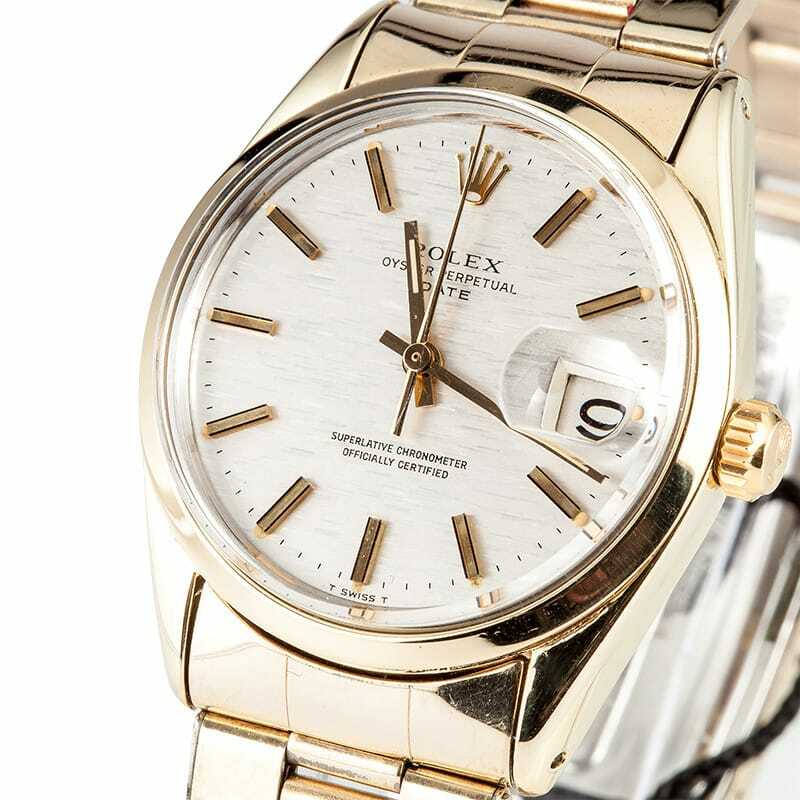 It features a beautiful yellow gold 35mm case with a smooth bezel and gold screw down Oyster crown. Interestingly, the case back is made of stainless steel. The Date 1550 is a 35mm yellow gold Rolex. The dial complements both metals and can be silver or gold with applied gold tone hour indexes, baton hands and center seconds. One of the most notable features of the watch is the triple sunk date at the 3 o’clock mark. Above the dial is a plastic crystal with a cyclops magnifier for the date aperture. This vintage Date is predicted to be highly valuable in the near future. The 1550 is a beautiful watch with great functionality. This vintage watch offers a reliable caliber 1570 automatic perpetual movement with 26 jewels. 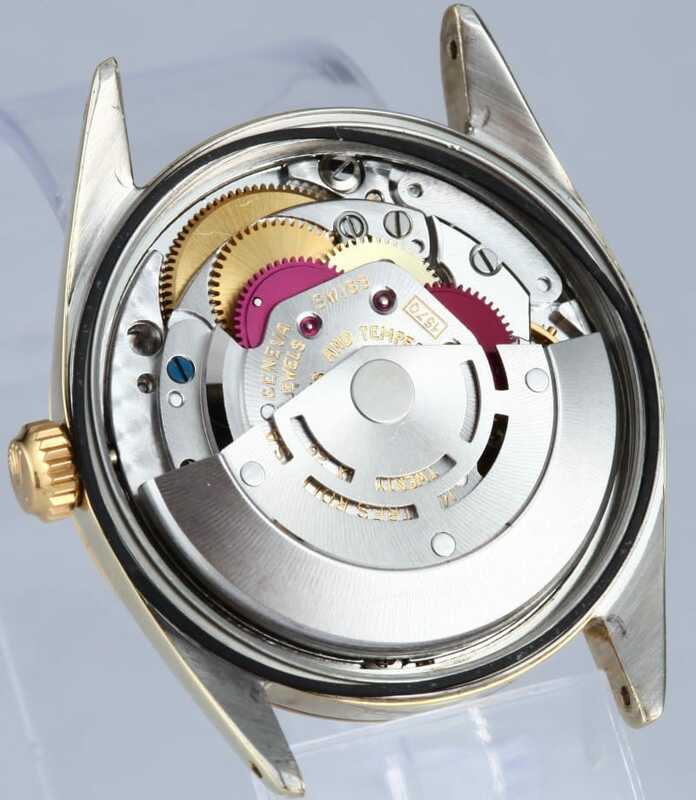 This automatic winding technology allows the user to forego worrying about winding the watch because the movement runs off of perpetual motion. This means that by simply wearing the watch it will be wound. If the watch is left still for too long, however, it will need to be wound. If you wear your Rolex ref 1550 every day or so, you will not have to worry about it. The watch is completed with a luxurious leather strap with a matching yellow gold Rolex “tang” clasp. The Rolex dial, movement and case are all signed. This beautiful vintage watch will last for a very long time. It is important that you do not miss out on your chance to own a sought after piece of Rolex history. If you are looking for a beautiful, authentic and well-priced Rolex ref 1550 in yellow gold, Bob’s Watches is here for you. 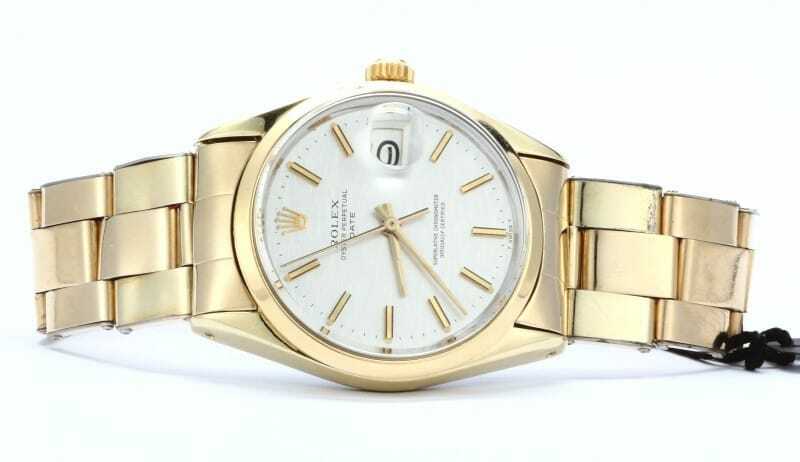 We only offer the best in vintage and pre-owned Rolex watches so you know you are getting exactly what you are paying for. The men´s vintage Rolex Date ref 1550 in yellow gold is a beautiful vintage watch that, as the years progress, will continue to rise in value and become more rare. This makes it the perfect addition to any Rolex watch collection, big or small.